We work mostly with clients in New York City as we are located nearby in Mount Vernon, New York. Petrillo Stone does many large commercial projects working for architects and contractors. Our services include stone cutting, carving, setting, and much more. We import stone from around the world to our shop where our skilled workers prepare pieces for installation. On site, we install and set stone in all types of settings interior and exterior. We provide premier service to not only to our commercial customers but also homeowners that are looking to add natural stone to their home. 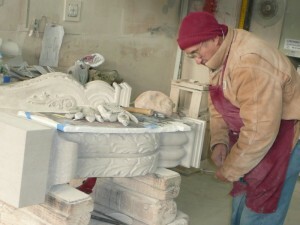 For residential customers we often create stone counter tops, custom carved stone fireplaces, mantles, and many other unique pieces. At Petrillo Stone we import and use the highest quality natural stone including marble, limestone, granite, bluestone, and brownstone. Our century of experience means we know which stone is needed and will advise you on the best choice for your specific project.